1. I love motorsports to begin with. Alongside films motor racing is my other big passion so combining racing with Pixar and John Lasseter was bound to end well in my opinion. 2. There isn’t a single human character. 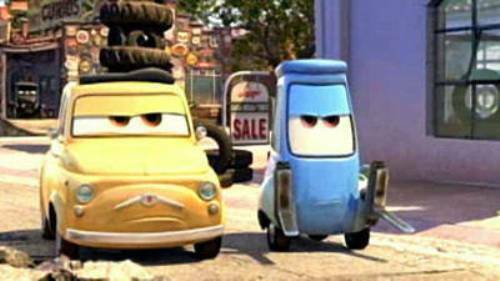 It might sound misanthropic, but I love that the cars are the characters rather than just being props that are driven by human characters. Even animals have been replaced by vehicles of some description, instead of “cow tipping” Lightening McQueen and Mater go “tractor tipping” one night during McQueen’s initial stay in Radiator Springs. 3. The residents of Radiator Springs. From Porsche Sally to tow truck Mater, the residents of Radiator Springs epitomise the idea of the eccentric little towns you find along Route 66, but they all work well together and play off each other so well and despite their differences, in the end they all need each other. Luigi is one of my favourite Pixar characters, partly down to my own love of Ferrari and motor racing. From his number plate bearing the coordinates of Ferrari’s Maranello factory and initial rejection of McQueen for not knowing any Ferraris to him fainting at Michael Schumacher driving into his tyre shop, Luigi is an amusing and adorable addition to the cast. 4. Doc’s return to the racetrack. What’s not to love about an old race car returning to his rightful place at the race track? 5. It’s still a proper good old Disney film. The Disney Princesses and Princes in their big castle may be gone but Cars is still a proper Disney film, it’s got the feel good factor with Doc’s return to the track and the Radiator Springs residents becoming McQueen’s pit crew and McQueen forfeiting his dream of the Piston Cup to help racing legend Strip “The King” Weathers finish his last race. And then there’s the happily ever after when McQueen realises he’s found his place and returns to Radiator Springs after the race in California, joining the likes of Doc and Sally who have found that Radiator Springs is where they belong.